Wildfires Rage Through British Columbia, Forcing 40,000 From Their Homes : The Two-Way Facing rampant fires in the western province, Canadian officials have called for help from the military and even Australian firefighters. And authorities only expect the situation to worsen. The Boston Flats trailer park was destroyed by a wildfire in Boston Flats, British Columbia, Canada on Monday. Wildfires are spreading rapidly across the Canadian province of British Columbia, so far eluding firefighters and forcing some 40,000 people from their homes. And with no rain in the forecast until Thursday, Canadian officials fear the fires currently raging will worsen before they can battle back the blazes. 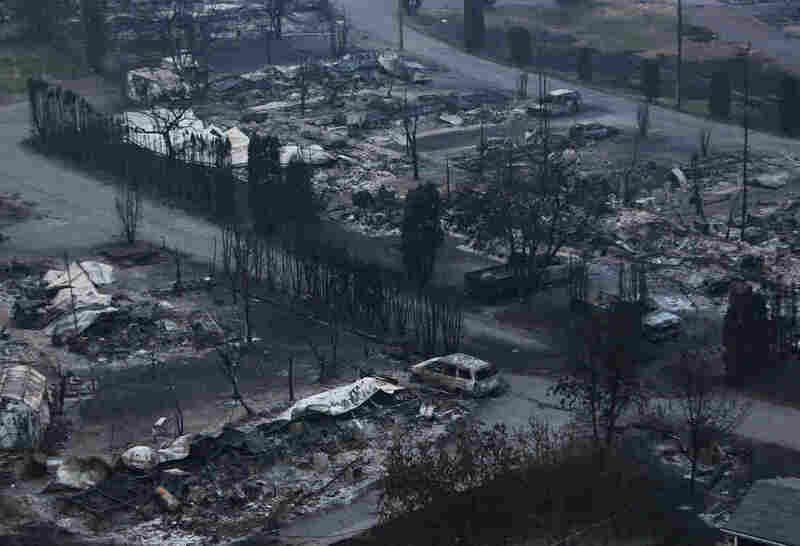 In addition to the more than 3,000 fire personnel now fighting these fires, authorities have also requested the help of the military and even Australia. The British Columbia Wildfire Service says the country half a world away will be sending 50 wildfire personnel, "including a combination of officers and technical specialists." They are scheduled to arrive in Vancouver on Wednesday. The service says the province's fire centers are preparing for "an anticipated increase in fire starts over the next few days." Still, the service's information officer, Kevin Shrepnek, tells the Canadian Broadcasting Corporation that firefighters are "certainly seeing progress out there, despite the challenges. It's hard progress to quantify." There have been no casualties reported from the fires, according to Reuters. Since the fires broke out northeast of Vancouver nearly two weeks ago, officials have declared a state of emergency in the province and evacuated the entire city of Williams Lake, which has a population of more than 10,000. "You think you're all ready until it comes down to it. You feel panic, you don't know what to do," Williams Lake resident Britanni Erlandson tells the Vancouver Sun. The fires raging through British Columbia come a little more than a year after a massive blaze ravaged the oil-rich town of Fort McMurray, in the neighboring province of Alberta. That fire forced the evacuation of more than 80,000 people before it was finally declared under control last July.